Home Sheducation Centre Barn Stables or Traditional Stables: Which One Should You Choose? Barn Stables or Traditional Stables: Which One Should You Choose? 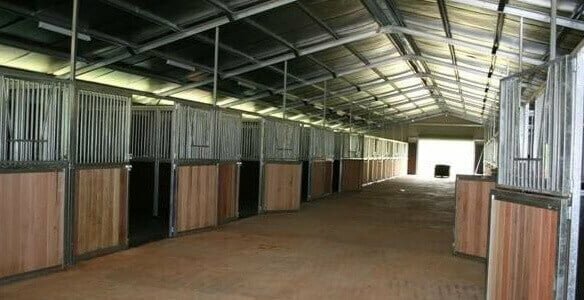 At Action Sheds Australia, we provide a wide variety of arenas, stables and barns. We can build to kit specifications or we can custom build a shed, barn or farm building to your specifications. Many of our customers in the Perth area know exactly what they want, while others consult with our experts to determine which of our offerings best suits their needs. We carry Durastall stables and can install them in either popular building for stables. Here is a comparison of the two types of stable configurations: traditional and barn. In traditional stables, one or more stables sit next to and parallel to each other. Each one has the door facing into an open yard. They are much more easily vented due to the door leading out into the yard, but you still have to make sure that there is adequate ventilation by installing a window and a roof vent. It is also recommended that you install a roof overhanging the stable to protect your horses from both sunlight and rain. When horses are each in their own stable, there is a much lower risk of cross-infection. Each stable has its own separate access point, making it more convenient to get horses in and out of the stable and to care for them. When you need another stable, it is easy to just install another one alongside the rest. When an isolation box needs to be disinfected, it can be done without disinfecting the entire yard. It is also possible to convert a stable into a feed, tack or rug drying room. In a barn stable, all of the horses are in stables, but all under one roof. All of the stables are inside, affording protection from the elements. Most stable barns are equipped with windows to the rear for fresh air. Most barns have high roofs, which encourage ventilation. All equipment can be stored right outside stable doors. All horses can be kept under one roof. Whatever your needs, Action Sheds Australia has your horses covered. Call us and talk to one of our experts to see which solution is the best for your situation: 1300 778 628.